Writing A Novel Is Hard Work! 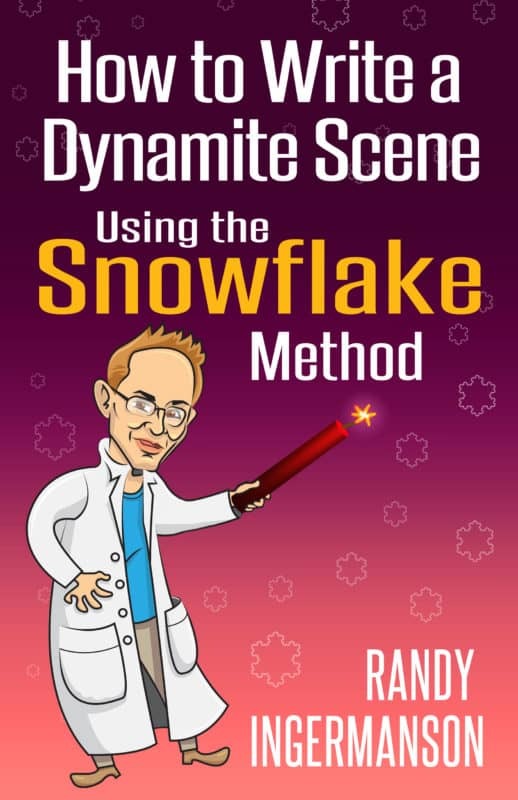 I’m Randy Ingermanson, known around the world as “the Snowflake Guy” in honor of my “Snowflake method” for designing and analyzing novels. I’ve written six award-winning novels. Before those, I wrote a few that never got published. Each story was tough to write. But the later novels were a LOT easier than the earlier ones. Why? Because one day I realized it was simpler to design my storylines and create my characters BEFORE I wrote my novels. That way, I was able to spend more of my writing time being creative and less of my writing time worrying about whether it was all going to fit together into a cohesive design. Years ago, I put my ideas together into an organizational tool I call the “Snowflake method”. That has become the most popular page on my web site and has been viewed over six million times. The Snowflake method is used by novelists all over the world. If you want to know what people say about the Snowflake method, Google “Snowflake method.”You’ll find that some people love it and some don’t. That’s because different people are different, which is fine by me. 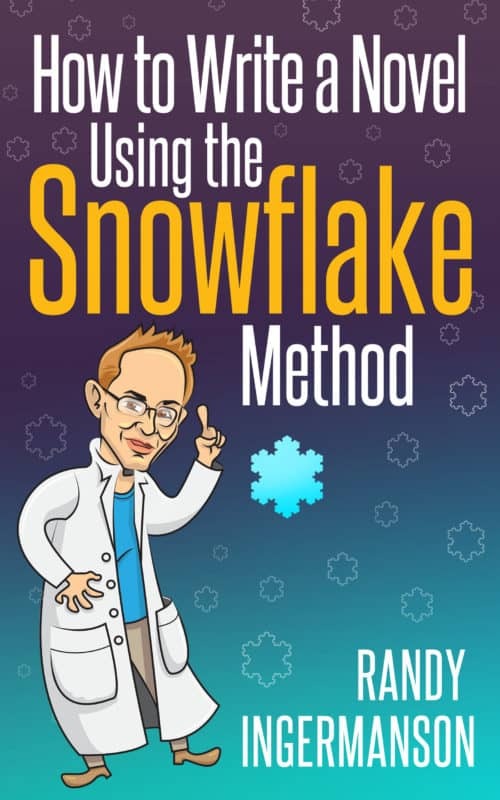 The important point is that zillions of people around the world use the Snowflake method, including a number of published authors. The good news is that I’ve written software to make it simple and fun to work through the first nine steps of the Snowflake method (everything but step 10, writing the actual first draft–you can already do that in any word processor). I’ve got more than thirty years of experience writing software. So I wrote a program, Snowflake Pro, to make the steps of working through the Snowflake method a joy — at least for me. Many writers have a hard time explaining their story to agents or editors. The Snowflake method asks you to define a one-sentence summary and then expand that to a Three-Act Structure. That takes some thinking. It forces you to really understand your own story. Several of the steps in the Snowflake method ask you to define your characters and then to get to know them — really well. This pays huge dividends in your fiction writing. The better you understand your characters, the more real they’ll seem to your readers. A modern novel has dozens of scenes — often more than a hundred. Managing all those scenes is hard, because they cover hundreds of pages in your manuscript. A Scene List allows you to see all your scenes at a glance. Snowflake Pro makes it easy to create and edit your Scene List. You can import your scenes directly from your synopsis, edit scenes, move them around, add new scenes, delete scenes that aren’t working, and estimate the page count of your story. And a whole lot more. Creating a Proposal — At The Press of a Button! Many editors and agents insist on receiving a book proposal for your novel. There’s nothing complicated about a proposal. It spells out a suggested business partnership between you and a potential publisher, explaining the risks and rewards of publishing your novel. The good news? Many of the pieces of a book proposal are actually steps in the Snowflake method. At the press of a button, Snowflake Pro will write the skeleton of a book proposal for your novel. If you do all of the first six steps in the Snowflake method, they’ll all go straight into the correct places in your proposal. If you skip steps, that’s OK — Snowflake Pro will leave empty slots in your proposal, with directions on how to fill them in. Snowflake Pro will also write in empty slots for things like your market analysis and marketing plan which are NOT part of the Snowflake method — along with some savvy suggestions on how to fill in these essential parts. If you’ve ever tried to write a book proposal, you know that the hardest part is just getting started. What should go in and what shouldn’t? How do you format it? How do you know if you’re doing it right? Don’t be paralyzed by uncertainty. I love writing proposals. I’ve written many. One of my former editors teaches “how to write a proposal” at conferences all the time, using an old proposal that I sold to him years ago. Use Snowflake Pro to get a running start on your proposal. And then use all the handy tips Snowflake Pro embeds in the proposal to guide you in polishing it to a high sheen. When you buy Snowflake Pro, you buy a license to run it on up to five of your own personal machines. For example, if you have a laptop and a desktop computer and you own other computers that your spouse and kids use, you are licensed to install and run Snowflake Pro on all of them. Yes, really. That’s a very permissive license. In exchange for that, I ask that you not pirate Snowflake Pro. I try to do the right thing by you; thanks in advance for doing the right thing by me. Will Snowflake Pro Run On Your Computer? I wrote Snowflake Pro in a language called Java, which runs on ANY modern laptop or desktop computer running Mac or Windows. If your computer was new within the last ten years or so, you should be able to just download Snowflake Pro, install it, and run it. I’ve worked hard with my team of testers to make the whole process as simple and error-free as we can. See the System Requirements below. If we can’t get Snowflake Pro running on at least one of your computers, I’ll give you your money back, of course. On Windows XP, Windows Vista, Windows 7, Windows 8, or Windows 10, you’re good. On a Mac, (Tiger, Leopard, Snow Leopard, Lion, Mountain Lion, Mavericks, Yosemite, El Capitan, Sierra, High Sierra, or Mojave), you’re good. Your one-sentence storyline. This is your most powerful selling tool for selling your book. Your one-paragraph summary. If somebody asks about your “Three-Act Structure,” this is it in one paragraph. Memorize it before you talk to editors or agents. Your character key info. Each character’s storygoals, ambition, epiphany, and other crucial information. If you don’t understand your characters, odds are it’s because you haven’t asked yourself the right questions yet. A one-page synopsis. Grow this naturally from your one-paragraph summary. This is your baseline for creating the synopsis you’ll need for your editor someday. Character sketches. These are terrific for inserting straight into a proposal because editors love character-oriented fiction. A four-page synopsis. Grow this out from your one-page synopsis. With this in hand, you’ll know all the important turns in your story. Character bibles. This is where you save all those pesky details you need to write three-dimensional characters. Take care of the details and your characters will take care of you. A scene list. You can get this rolling by importing one of your synopses, then tweak it so you have an overview of every scene in your novel. This makes rearranging scenes in your novel a breeze. Includes a word-count projection so you always can estimate how long your novel will be. Scene details. Any stray information that you need for each scene goes here. Don’t lose that info! Put it where you can’t miss it. Audio help on each stage of the Snowflake. If you’re an audio learner, this will help lock it into your memory. Text help on each stage of the Snowflake. If you need to see the words, this is for you. A button to create the skeleton of your proposal. Click that button, and Snowflake Pro will write an RTF file that contains the core of a proposal. Don’t be paralyzed by doubt about how to write a proposal. The accumulated wisdom of 30+ years of a published novelist. I’ve published six novels. I’ve won about a dozen awards. The Snowflake method contains what I believe to be core to writing fiction. I have no patience for the fluff, so I left that out. I looked at various software tools for novelists in software review articles in Writer’s Digest. The trend was clear: The simple tools are free or very inexpensive. The complicated programs tend to be very pricey — hundreds of dollars. I thought hard about those tools and their prices. I don’t want to make Snowflake Pro too expensive, because I want to give you good value for your money. But I also don’t want to price it too low, because I believe that people don’t value things that they get too cheap. I want you to value Snowflake Pro enough to use it. Based on those thoughts I’m setting the price of Snowflake Pro at $100. I believe that’s a fair price that will repay the effort I’ve put into learning to write fiction, learning to teach it, and creating Snowflake Pro. I believe it’s also a price that will encourage you to use it hard. $100 is not pocket change. If you spend that much on a product, then you’re probably serious about developing your craft. Over the years, I’ve found that the writers who put the most effort into their work are usually the ones who advance fastest in their craft. I love coaching the really hard workers. Snowflake Pro is available for immediate download. It should normally download in less than 30 seconds on a cable modem or fast DSL. Get it now! When you buy Snowflake Pro, as soon as my system has confirmed your credit card or PayPal information, it’ll take you right to the download page. You’ll get an e-mail too. My system will send you an e-mail within a few minutes with a link to that same download page. 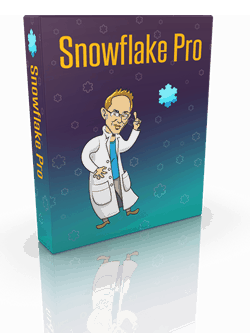 Please remember that Snowflake Pro is ONLY available as a download, NOT as a CD. This is pretty standard these days, but I still occasionally get an email asking for a CD option. There isn’t one. Please remember that if you have some glitch in downloading or installing Snowflake Pro, the problem is most often a problem with Java. Most of my customers don’t have any problems at all, but if you hit a snag, please make sure that the latest version of Java is installed on your system. It’s free and you can get it at the official Java web site. If that doesn’t solve your problem, send me an e-mail from my Contact page and I’ll do my best to get you squared away as fast as possible. Want a discount on Snowflake Pro? I’ll make you a deal that’ll help promote my best-selling book and will save you a bundle. Why would I give you such an outrageously good deal? Several reasons: I believe in my book and I want to do everything possible to make it succeed. Plus I wouldn’t mind increasing the volume on my hottest-selling product, Snowflake Pro. Plus these are tough economic times for everybody, and I want to do my part to help writers through. So this deal is a win-win situation, which means it’s just plain good business. Buy How to Write a Novel Using the Snowflake Method at any bookstore in the world or any online store. Just below, I’ve got a set of links for all the places you can buy it online. If you already own the book or audiobook, no problem — you still get in on this deal. I’d like to thank my team of Alpha Testers who helped me test the downloading, installation, and running of Snowflake Pro on a wide variety of computer systems. In alphabetical order, they are: Rick Acker, Tom Adshead, Bryce Beattie, Sven Bergner, Jeannie Campbell, Phil Conrad, Sean Dare, Peter Economy, Meredith Efken, Dale Emery, Jorg-Peter Friederich, Lynne Gentry, Tim Greene, Jeff Hilton, Jim Huskins, Chris Kirkby, Tosca Lee, Steve Lewis, Ken Marable, Alastair Mayer, Colleen Peterson, Srey Seng, Lynetta Smith, William Stanley, Guy Wade.